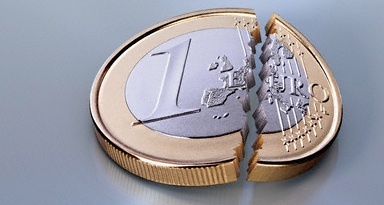 Amid the banking crisis in Ireland, everyone's asking: "can the Euro survive?" There is a well known Torah maxim: anything that is built on 'sheker' (lies) cannot subsist. The whole monetary union enterprise was built on false accounting by individual states anxious to join the 'club' and reap all the goodies being handed out by the richer countries. Well, those richer countries aren't so rich anymore. And they'll be a helluva lot poorer by the time they get to bailing out Spain ... for whatever that's worth. Truth be told, the EU is as bankrupt morally as its currency is financially. The European Commission is nothing more than a den of thieves, whose unelected apparatchiks grow rich on falsified expenses and claims for second and third homes. I know a contractor who worked on the EU parliament buildings. The greed of these grubbing mandarins is quite staggering. No wonder its auditors are now in the 16th straight year of refusing to sign off the EU accounts. All the austerity measures planned by the UK coalition government are but a drop in the bucket compared to the £20 billion a year which Britain could save by dumping the EU. What a breath of fresh air that would be ... and oh! to be finally free of their Human Rights industry and stifling employment legislation. Good riddance to the EU and its currency.